Conservative councillors Tim Eagle, Donald Gatt and Frank Brown at a pre-budget meeting. Picture by Jason Hedges. The cost-cutting plans include measures to raise council tax by 4.7% and increase fees for children taking music lessons at school. Overtime will also be reduced for janitors and less money will be spent on cleaning in schools across the region. Commercial harbour fees will also increase. And councillors agreed to give communities a year to decide whether to take on the ownership of closure-threatened toilets. A total of 84 jobs will be lost under plans announced in the budget which was described as the “toughest in the history” of the local authority. Early retirement packages will be offered along with voluntary redundancies. Staff could also be deployed to other areas of the local authority under its Transform program. Council leader Graham Leadbitter described the situation as the “toughest” in the council’s history. He said: “It is a fact that much of the low hanging fruit of budget savings and efficiencies has been taken and that is obvious from more recent budget as councillors have faced more and more challenging options to consider. “While we want to keep council tax rises at as reasonable a level as possible, the strong feedback we have received is that people are willing to pay a little more to protect services as best we can. “We are a small rural authority and with that comes some significant challenges. However, there was good news for some communities with all 20 public toilets given a temporary reprieve to give the public a chance to take them over. Campaigners hope to persuade council bosses that they can turn some of the buildings into wi-fi hotspots or tourist information sites. The council also made a U-turn on proposals to increase school music tuition fees by 85% to £699 a year. They will now be raised by 10%. Although school crossing patrollers will still be axed, along with the region’s museum service. Keith and Lossiemouth swimming pools have also been saved along with the Active Schools sport service thanks to the support of the community signing up for over 400 Fit Life membership cards. Opposition leader Tim Eagle insisted that it was “not a day for celebration” in Moray, despite some positive decisions. He said: “The savings we are making today will undoubtedly impact on all and we will need to ensure the very best partnership working we can with individuals, groups and organisations throughout Moray to ensure where possible we mitigate the consequences of these savings. “As a group we could not get away from the financial facts surrounding the council and whilst many of the budget lines are deeply concerning the reality is we are legally obliged to deliver a balanced budget and we can only do what we can with the money we receive from the Scottish Government, the major funders of the council. A Scottish Government spokesman said: “We continue to ensure that our partners in local government receive a fair funding settlement despite further cuts to the Scottish budget from the UK Government. We are delivering a funding package of £11.2 billion for local authorities next year – a real terms increase of almost £300m for essential public services in Scotland. 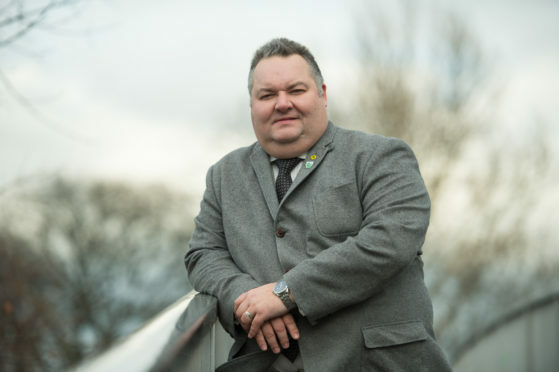 Former council leader George Alexander issued a stark warning about the potential risks associated with the budget, while also calling on his fellow councillors to work together for a better future. He said: “There are a lot of extra risks associated with this budget in addition to the unknown of Brexit. 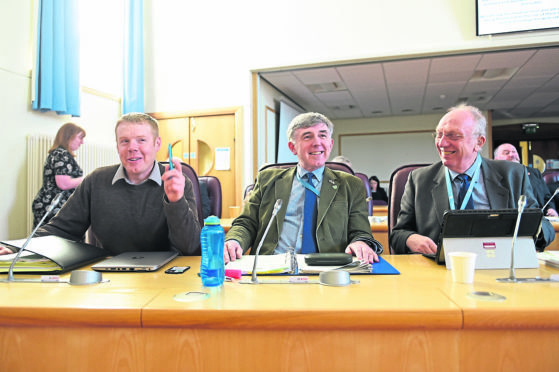 More than 400 local people signed up to the scheme over the last month, which prompted the council to keep Keith and Lossiemouth swimming pools open. Council leader Graham Leadbitter warned that there was more hard work to come. He said: “There’s been a bit of a sigh of relief cause it has been a pretty long and challenging process to get to this point but looking ahead we cannot rest on our laurels. The news that public toilets would get a reprieve was welcomed by Laurie Piper, managing director of Moray Speyside Tourism. He said: “I am very pleased that these positive steps have been taken and I hope that this is the start of a positive and productive engagement to identify a sustainable forward plan for the toilets. However, despite music tuition fees only rising by 10% instead of the originally proposed 85%, head of music instruction services John Mustard said he would not reverse his decision to resign. Tomintoul residents put forward a 645 signature petition to the council to argue against shutting both the library and public toilet in the tourist resort, with 55 of them threatening to protest outside the council building yesterday. They welcomed the u-turn by the council and sent a message warning that if the local authority try something like this again, they would fight the move. Gollachy recycling centre was also threatened with closure in 2020, and two community councils, Lennox and Buckie joined together to start a campaign to save it. They collected over 2,500 petitions, and their hard work was rewarded with the centre being kept open. Lennox Community Council chairman Colin Hanover hailed this change of heart from the council but revealed that they will be partnering with other community councils to see what can be done about some of the cuts that have gone through. He said: “I’m pleased to see one aspect has been looked at and amended but there are still some things like school crossing patrollers that we will have a look at.